Fraser Nelson of the Spectator examines this decision and the fact that only a few months ago the MP was telling everyone to get behind the PM. Whether you want to get out of Europe or simply want a referendum to resolve the matter once and for all it is worth a read. According to insurer NFU Mutual, the cost of rural crime on the UK's rural economy is up 5.2 per cent on 2012's figures, reaching £44.5m last year in 2013. The NFU creates an annual rural crime report based on claims data and this year's report identified a rise in cattle rustling and the theft of high-value agricultural equipment. My advice of course would be make sure everything is locked away and as secure as is possible. Farm insurer NFU Mutual’s rural crime survey says the most common items targeted by thieves in the North East over the last 12 months were quad bikes, metal, and horse transport and equipment. Rural crime is definitely becoming more sophisticated and Northumbria Police must ensure that tackling and preventing rural crime is a priority. The cost of thefts from farms across Northumberland and County Durham rose by 12% in 2013, costing the regional economy an estimated £840,000, compared with £750,000 a year earlier. On Wednesday September 3rd at 7pm I have the 30 minute Adjournment debate in the Commons; I applied in July to the Speaker and this debate was recently granted. The key issues I propose to raise I have been discussing with key local activists over the summer, including several members of the Tyne Valley Rail Users Group, and other activists concerned about the state of our roads in Northumberland. We also have a number of key bus issues to raise. On trains I will be focusing on the rail infrastructure in Northumberland, focusing on the Tyne Valley Line between Newcastle and Carlisle, but I will also be addressing many other rail issues like the Gilsland and Bardon Mill stations. - the rolling stock is old, there are issues on fares and and other issues and there is no Wi-Fi on the trains; we feel that the service is the poor relation of the Northern Train Network, notwithstanding a passenger increase; there are concerns as to the Northern Rail Franchise Consultation - noone wants to see lesser services. I will be asking about the possible Designated Community Rail Service and what this means, in reality. - Gilsland Station rebuild: this is presently in the GRIP system but needs more Northumberland county council and network rail support. The old station was disbanded many years ago. Lots of the infrastructure remains and it would provide a massive boost to jobs, tourism and infrastructure if it were reopened. I am a big supporter. - Rail crossing improvements – a Network Rail issue but we are looking to explore the future upgrades and improvements programme. - I will also be raising the bridges controversy, notably the Bardon Mill proposed bridge, which I visited last week and spoke to residents and members of the Parish Council about. Finally on trains I shall discuss the fact that the North East has no Oyster Card system for an integrated transport network system, as London and elsewhere does have and why this is the case. On Roads I shall be raising A 69 Improvements west of Hexham leading to the Cumbrian Border. It is an accident black spot and I saw the Secretary of State for Transport on this issue last session; clearly money is tight but we want to know that we are in the queue for upgrades. Similar comments apply regarding the A696 safety improvements north of Ponteland. We will also be raising traffic safety elsewhere in Northumberland, and continuing to push for the A1 upgrades. As always please get in touch with your comments, requests and suggestions. I have received many comments thus far over the last few weeks on many of these issues. All thoughts very welcome. Greatly looking forward to taking our cross party Better Together team from all across the North East to The Borders tomorrow. The introduction of charges for Post 16 school travel has already reduced the number of students using the service and leaving others in limbo. In a letter send to parents by the Council's Passenger Transport Operations Manager a Council officer informs parents "We have not so far received the same volume of applications for transport from Post 16 students that we would normally expect this time of year This is probably due to the recent changes regarding the provision of Post-16 transport." We warned the County Council that parents in rural areas could not afford their new £600 tax and already we have the evidence. The Council received dozens of letters from families in rural Northumberland warning they simply did not have the money for this new tax on school transport. It is very sad to see that already there are less applications. Parents have been told by the Council it was "not in a position to award your child a seat from 2nd September." - which is the start of term! In the Council's rush to impose charges on rural families they have created chaos in their own system. We now have the ridiculous state of affairs where some parents do no even know if their child will be able to get the school bus. That situation is not acceptable. 8.30-5pm and so much to do for all the family. Come along and support the iconic show. It makes sobering reading. But if you want a high tax, union controlled, job destroying, approach to an economy and a country then vote for the Two Eds. There was no better orator than Martin Luther king. His speech in Washington calling for the end of discrimination and equal rights is a classic. Our campaign to protect Northumberland’s greenbelt has received a major boost as the Government has announced a new fund to promote development on brownfield sites. Councils across the country can now bid for government funding to build thousands of new homes on brownfield land. The £200 million fund will be shared between up to 10 new housing zones, all which must be outside of London. It is hoped the sites will deliver between 7,500 and 20,000 homes. plan to develop more brownfield sites. disused and derelict land, and ensure the new homes are built quickly in a process that is more straightforward for councils and builders." further help protect the greenbelt. I have written to Northumberland County Council to encourage them to prepare a bid for this project. Across the country the level of greenbelt development is at its lowest rate since records began in 1989. As it stands the Council’s draft housing policies are simply unsustainable. Just spoken to the better together team in the Borders and we have been asked to spend the day in Hawick in the borders this Saturday. There will be opportunities to canvass or simply deliver leaflets. This campaign is apolitical, cross party and a with a simple message to the Scots - please stay! There is also a public meeting taking place in Hawick on Saturday of which more layer this week on the blog. Over the last 4 years I am proud as an MP that I have supported apprenticeships by hiring, training and then retaining an apprentice, working out of the Hexham office. We have also had over 150 work experience and interns in Hexham and occasionally in Westminster. At all stages we are trying to ensure that people are seeing what I do as an elective representative week in week out, and try and get an understanding of the everyday demands and duties of an MP. This week I have a young student, Joshua Babajide, helping Dan in the Westminster office, and trying to learn more about politics and the office of an MP, albeit I am based in Hexham this week. Joshua comes to us via the Social Mobility Foundation, which is an excellent charity that aims to make a practical improvement to the lives of young people by helping them gain work experience in a range of professional environments. This is a charity that is doing so much to help young people get their first experiences of a number of different professions. Other students from the foundation go and experience what it is like to work in a variety of career sectors such as Accountancy, Media, Engineering and Law. It is nice to know that, out of all the possible fields, Joshua decided to learn more about politics. I have long campaigned to get the present bus station retained and upgraded. The consultation is now being considered by the council. All letters or emails to me these last few months are definitely part of the consultation. Ten days ago there was a march in Hexham - I could not go as I had long booked surgery appointments with 2 local businesses and had agreed to visit several local constituents at their homes in Heddon on the Wall. Sadly the diary has to be planned in detail and a fair way in advance, particularly in August, which makes the ability to change plan spontaneously quite difficult. SECTION ONE: Opening statements - Alex Salmond will go first, Alistair Darling second. (Salmond won the coin toss and elected to go first). SECTION THREE: Cross-examination - Alistair Darling will go first, Alex Salmond second. (Darling won the coin toss and elected to go first). Today's 90-minute event will be staged at Kelvingrove Art Gallery and Museum in Glasgow, in front of an audience of 200 people selected by polling and research consultancy ComRes.The debate is being presented by Glenn Campbell. There are still a couple of places to be filled on our battlebus to Scotland this weekend. I was pleased to support the Guide Dogs campaign to make travelling by bus easier for people with sight loss. The Guide Dogs’ campaign is to make sure all new buses have audio visual (AV) next stop announcements, which are vital for blind and partially sighted bus travellers. It is clear that announcements enable blind and partially sighted people to understand their location, and prevent them from missing their stops. Guide Dogs is calling for the Government to require all new buses be fitted with AV, as currently bus operators are under no obligation to include this technology when upgrading their fleet. I am pictured with puppy walker Vanessa and Ushka the puppy and Community Engagement Officer Sue Rowan and her guide dog, Layla. On Tuesday I took the Hexham to Carlisle train to help campaign for my friend and colleague John Stevenson MP, and his local councillors. John is hoping to be re-elected as Carlise's MP in a little over 8 months and it was wonderful to be able to help him out. He has been working in Carlisle, and a councillor in Carlisle, long before he became an MP, and knows the town inside out. He is a genuine hard working MP who cares passionately about the place he represents. In Westminster his work on skills, apprenticeships and supporting manufacturing and local jobs for Carlisle is well known. Haltwhistle Walking Festival Autumn Programme now published - come along! Book now to avoid disappointment - I am going to try and go at some stage on the weekend of the 18-19th but diaries are always difficult, not least as the House is sitting. Visitor numbers are up 6% and the good news is that Heathrow will be broadcasting the beauty of the north east and the star attractions from early September. Details of the top 20 sites both paid for and free are set out below. I visited the Hexham branch of Ladbrokes on Tuesday to meet the local staff, hear about their apprenticeship scheme and discuss efforts to promote responsible gambling. 2 good charity causes riding on this so no pressure lads! The game is at 12.45. For over 5 years we have been looking to relocate Hexham Fire Station and I have held many meetings with Fire Officers including the Chief Fire Officer,Alex Bennett,and many other firemen who do such a good job across Northumberland. The station has to move for a variety of reasons, not least the fact that the present site is a flood risk. The preferred new site is now to co-locate with the Hexham Hospital. I am fully behind this idea for a number of reasons, not least that all 3 emergency services know it is my strong view that we should have co-location of emergency services wherever possible. As they all know I would go further with far greater co-responding and interconnection between differing services in responding to events, led by the relevant expert. This particularly applies in truly rural areas. The Hexham Hospital site is not perfect - no site ever is - but it is a massive improvement on the present site, it comes at a genuinely reasonable cost given the alternatives, and provides Hexham with a 21st Century Fire Station. It also allows the Northumberland County Council to reassess and use the present Hexham site, and the alternative Golf Course site that has lain idle for many years. Given all that my provisional view is to back this move wholeheartedly, although I want to see the product of the consultation and see what comments are made. The Commons debated this issue before the House rose and my position is set out in brief in the speech I gave, the link to which is below. "To misquote Charles Dickens in 2014, these are the best of times and the worst of times. It is an age of wisdom and an age of foolishness. There is a season of light, there is a season of darkness. There is a spring of hope and there is a winter of despair. To look at the worst of times, others have set out graphically the vast scale of the problem. There are 50 million refugees, and huge numbers of Syrians, for example, are fleeing that conflict zone—it is that country I particularly want to focus on. We debate the issue on 22 July with conflict in Gaza and Israel, with no cessation of rockets or hostilities, no durable ceasefire and no progress to a two-state solution. At the same time, Russia and Ukraine are in a separatist dispute that is producing ever more refugees, and there has been the horrifying loss of flight MH17. One could say that the debate brought by my hon. Friend Pauline Latham MP is particularly timely because there is a risk that while all those atrocities are going on and being shown on the television, conflicts and refugee situations that have been going on for a considerable time have almost been forgotten. It is a fantastic aspect of the House of Commons first, that when we get this job we gain a greater understanding of the huge complexity of the problems faced around the world and secondly that, on a hot and steamy morning, Members from four different parties are here, making the case that we genuinely all care, on a cross-party basis, about the suffering of the individuals involved in these situations." For more details on the debate and my speech click on the link above. He is wrong on many issues and fortunately retiring at the next election. I think it is a very good thing that the commons is becoming more representative of the country, with many more female MPs at every election. I help lead Women to Win and have helped train such future Conservative stars as Nusrat Ghani, Lucy Frazer, Maria Caulfield and Vicky Atkins. All will be amazing MPs, and are presently excellent candidates in Wealden, Cambridgeshire, Lewes and Louth. I could go on about certain MPs in all parties saying things they should not but this is not ageism. What annoys me about Austin is that we rarely see him in the commons chamber. There are some veterans who are there a lot - whether you agree or disagree with them Dennis Skinner, David Winnick, Richard Shepherd and sir Peter Tapsell all contribute a great deal. All are 70+. So on this issue I am strongly against Austin and stand on the barricades with the female MPs who are rightly up in arms. Eventually the dinosaurs became extinct. I hope Austin's views will be extinct soon too. The 50th annual RHS Britain in Bloom UK Finals Awards Ceremony, will take place in Bristol on 16 October 2014. Only then will we know if Great Whittington has won best small village. If you have not visited it is a beautiful village - immaculately looked after. Full credit to all the locals who have put in so much effort. There is no doubt that Darling won the first debate, and that Salmond seems ever more desperate. His argument on the pound is unravelling. If he wants independence then he can have it – provided the Scottish people agree. But with independence comes a different currency. It is that simple. Last week’s suggestion by the SNP that Scotland is more predisposed towards ‘social justice’ than other parts of Britain is frankly absurd, and embarrassing. I hope to continue our campaign to maintain the Union and that ultimately Scotland will say “No thanks”. On Sunday August 24 at 11am at St Mungo's church in the beautiful village of Simonburn many will attend to celebrate the work and effort of Michael Thompson, who has been an outstanding local vicar in Humshaugh and the surrpounding villages. His retirement service is a Holy Communion. If you are free do go along to celebrate his work locally; it is also a lovely church. Last Friday I became a Dementia Friend. Along with dozens of locals we met at the Dyvels local pub in Corbridge for an assisted walk around Corbridge, discussion about the progress Corbridge is making to become the North East leading dementia friendly village and to receive training. Many of us were trained by Councillor Melvyn Stone to become a Dementia Friend, as part of an Alzheimer’s Society initiative that aims to give people an improved awareness of the condition. In my view Dementia Friends is about giving people an understanding of dementia and the small things they can do that can make a difference to people living with dementia. From helping someone find the right bus to spreading the word about dementia, it can help make our local community a better place to live. Full credit and thanks to the Corbridge Town Council, Melvyn, the team from the Alzheimer's Society and Chrysalis and all the local businesses and volunteers who make this awareness, training and change in Corbridge possible. Is an independent Scotland entitled to keep the Pound as is? - "On what basis would Scotland get to keep the pound? Would it be used informally, just as some Latin American countries, Greece and Montenegro use other currencies? - Why should the Bank of England take notice of Scotland in setting monetary policy? - Why should the Governor travel to Edinburgh and be interrogated by Scottish MPs in such an event? - After independence, surely the Governor would owe his appointment entirely to a rest-of-UK appointment system? - At that stage, would the First Minister come to London seeking an audience to negotiate? - when one goes through Mark Carney’s speech and looks at the currency options, it would seem that the SNP proposes to keep the pound as part of a formal sterling currency union agreed with the rest of the UK. However, the SNP seems not to have contemplated the fact that that would involve giving up huge amounts, as Mark Carney made very clear, as well as requiring the agreement of all other parties. The SNP seeks independence but would require and accept greater control by a third party." Many more details on the debate in parliament at the link above. Referendum Road Trip 2014 on 30th August to help save the Union! Join us on the battlebus! 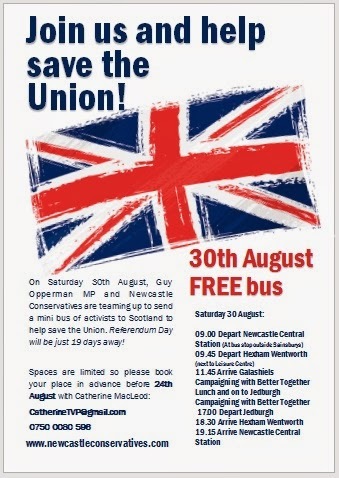 On Saturday 30th August, myself and Newcastle Conservatives are teaming up to take a mini bus of United Kingdom activists to Scotland to help save the Union. Referendum Day will be just 19 days away! You do not have to be a big or small c Conservative to come. We welcome everyone, form all political parties and all persuasions. Several people have signed up who are definitely not Conservatives. But we are all committed to the Union and believe we are better together. It will be fascinating and a lot of fun. If you live in England you do not have a vote but you do have the opportunity to make a difference. Come with us and tell the many Scots we intend to talk to that they are better off saying "No Thanks" to Alex Salmond. Another amazing Roman find! If you have not been to Vindolanda you need to go but these kids found more than they bargained for when near Kirkhaugh! NECC Policy and Research Manager, Mark Stephenson, said: “Once again the North East has provided a record-breaking set of figures with more people in full time employment than ever before. A welcome addition to this is the decrease in the employment rate – one of the biggest two decreases in the UK – and an across-the-board decrease in unemployment." “The improvement in the North East employment rate remains one of the more eye-catching statistics from across the UK and has been deemed “statistically significant” by the Office for National Statistics. The decrease in the claimant count figure is again welcome and continues a longer-term trend. This figure is now at its lowest since September 2008 before the financial crisis and the economic downturn." North East Employment now stands at 1,191,000 – a rise of 15,000 over the quarter and 64,000 over the year. · North East Unemployment is now 126,000 – a fall of 10,000 over the quarter, and 6,000 over the year. With the General Election just over 9 months away there has never been a better time to come along and get involved with our campaigning. All of our Super Saturday Action Days take place on a Saturday at 11am. Everyone is welcome and there are a range of activities so you only do what you are comfortable with. All of the information you need is below so just come along! However if you would like to know more please contact the team on teamoppy@gmail.com and we will be right back in touch! 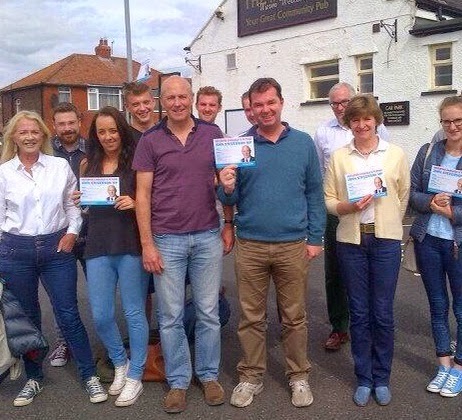 We never cancel our campaign days, but if it’s too wet we may just head to the nearest pub! The Prudhoe Walled Garden at the old hospital site is a genuine gem. I have been helping the group who are trying to ensure that as the Hospital site is developed this lovely walled garden is preserved for the future, possibly with a community use. As always this requires huge effort by a dedicated band of volunteers and the team behind the Walled Garden are doing a great job. We owe them a great deal and I will help in whatever way I can. I am going to try and pop in Thursday morning but do go and lend your support. This is a great project for Prudhoe. The cricket will last 2-7pm. At the same time there will be activities for the youngsters, a football stand a beer and Pimms tent, and a BBQ from 4pm provided by local businesses Flat Cap Kitchen and the Northumberland Sausage Company. There will also be music and a raffle - with prizes donated by Slaley Hall, Tim Healy, SCA Prudhoe and Brendan Healey to name but a few. Please do come along and support the event - there really is something for everyone. £1 entry on the gate, youngsters under 12 go free. All proceeds to a local and hugely worthwhile cause, Tynedale Hospice. My thanks in advance to the sponsors and everyone who has given up their time for this cause - I am defintely going to be praying for a sunny day in church on sunday! My thanks to SCA - a brilliant local employer and makers of soft, strong and very Northumbrian Loo Roll. 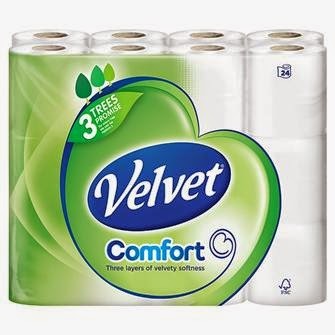 SCA have donated to the Tynedale Hospice at Home Charity Cricket Day a pallet of toilet roll; this is, I am told, although I have not personally counted, around 900 rolls worth over £500. This is quite some auction prize....a prize for the best caption / trailer for Sundays cricket match - about which more tomorrow. A few colleagues on both sides of the House are calling for parliaments recall. For my part my present plans are simple - today I am in Westminster and then the next 3 weeks I am working in Northumberland, catching the 8am train north tomorrow morning. If we are recalled then it is a simple process, but I do not seek a recall. What we can, or should, decide to do differently is a separate matter, which is much much harder. There is no doubt that the ISIS threat to Middle eastern stability, and normal life, is all too real for the embattled minorities such as the Yazidis, the Kurds and Christians. I believe our present approach is the correct one with extensive aid support, diplomatic pressure, some technical specialist support and extensive efforts diplomatically in bringing the western allies to a supportive agreement that threatened minorities should be protected. The question is whether we wish the RAF to get involved in air strikes against ISIS, or our troops to be more active in events in the Middle East generally? This is the desire of some commentators and former military chiefs like Lord Dannatt. I respect the former general but there is no appetitive for boots on the ground amongst my constituents. As always, we have to ask simple questions like - what would our objective be, how long are we prepared to be involved, who are we helping, what is the cost in terms of loss of life and what are the unintended consequences? I definitely want to see the rest of the Arab world step up to the plate where there is conflict on their doorstep. Part of the problem is the expectation that it is always the USA and western alliance countries, including France and Britain, who will do the heavy lifting and the hard yards in their backyard. The flip side of that is that having got involved in regime change through Blair more than 10 years ago some would argue that we are duty bound to support the country that is now struggling to defend itself from radicals? But any actions in the past - whether we agree or disagree with the Blair / Bush approach - do not mean we have to act now. Finally, there is no doubt most constituents of mine were strongly against any action in Syria when Assad was caught using chemical weapons on his people. I certainly want the current humanitarian effort to be extended, and want a better coalition of supportive countries led by the UN to be assessing the situation. I am also certain that UK military and diplomatic chiefs are assessing options but the reality is that this is a very challenging and changing situation literally thousands of miles away. But I do not seek parliaments recall for now. Corbridge is leading the way in the North in showing how a village can both cope with dementia and support local people who are suffering from this terrible disease. I have met with many of the local councillors and supporters and professional organisations in May and previously so I am delighted we are doing this follow up. So this Friday I will be going to The Dyvels in Corbridge and taking part in a Dementia Friends Supported Walk to begin at 11am, for 1 hour. Attendees include: Cllr Melvyn Stone, Corbridge Parish Council, who has been leading on the Corbridge project, Lorraine Oliver, North Country Leisure, Representatives from Barclays Bank, Cllr Jean Fearon,Amy Syron-Mallenby – Alzheimer’s Society, and Cllr Maurice Hodgson – Chair Corbridge Parish Council. There will also be many members of the public and several dementia sufferers coming too. I am told the walks are very popular. The walk will be a gentle walk along the river bank, around the cricket ground, finishing back at the Dyvels. Melyvn will deliver the session, which aims to help people understand five key facts about dementia using a range of interactive activities and analogies. Melvyn will aim to keep the session quite short, which should allow time for questions and discussion. If you are interested, are a carer, or simply keen to help or understand better I urge you to come along. - possible new larger forests on sites to be identified and agreed by local councils and interested bodies. No one is contemplating another Kielder Forest but a smaller forest on a scale of Slaley or Wark is not unrealistic or unattainable in my view. This may need a change in viewpoint by several people or public bodies and possible change in direction but that is what discussion and debate is about. The simple point is this - what are we prepared to do to ensure there is a forestry and timber business in the North well beyond 2030? The event is also front page of todays Courant and reported at length in the Journal. Really pleased for the Air Ambulance crews and support staff who will be chuffed by the Prince's decision. The Association of Air Ambulances (AAA) and the All Party Group for Air Ambulances in the House of nCommons has gone from strength to strength these last 2 years but this is the icing on the cake: the news that His Royal Highness The Duke of Cambridge is to become a helicopter pilot with East Anglian Air ambulance is a massive boost to the Air Ambulances all over the country. His decision to pursue this role following his time as a RAF Search and Rescue pilot is seen as a strong endorsement of the part that air ambulances play in caring for the sick and injured in UK. East Anglian Air Ambulance is one of nineteen other charities that operate the thirty six air ambulances across the UK, providing advanced pre-hospital care to the most critically ill patients. On average seventy patients per day are treated by the thirty six aircraft. “We are delighted that East Anglian Air Ambulance and the East of England Ambulance Service have such support. The Duke of Cambridge made it clear earlier this year that he was considering this option as part of his public service duties. The announcement will, we hope, help to raise the profile of the work of all air ambulances in the country." Hexham Market today - support your local farmers, growers and producers! Congratulations in playing your part in our #YourGreatBritain competition and securing the North East a £1 million advertising campaign at Heathrow. Despite losing the lead with just 48 hours to go, thanks to your support, the North East pulled together and showed not only to us here at Heathrow, but to the entire nation, that it is a region built on pride. Heathrow – the UK’s only hub airport - is one of the busiest airports in the world, with around 73 million passengers travelling through every year. We are delighted that with 7 daily flights from Heathrow to Newcastle, we are able to connect businesses in the North East to their global markets and give easy access for overseas tourists to enjoy the incredible landscape, history and culture that the North East has to offer. With this competition, we wanted to show our commitment to delivering growth for the whole of the country. In March, Heathrow began a 12-month advertising partnership with VisitBritain where we gave £4 million of advertising space to inspire visitors to explore the UK. The first three months of the partnership promoted the previously flood hit areas of Devon, Cornwall, Llanddwyn Island (Wales Coast Path) and Glastonbury, to show they were back on track and open for business. The second round of adverts that went live in June were chosen to coincide with the Tour de France Grand Départ, illustrating Yorkshire’s celebrated countryside, as well as the region’s retail and architectural strengths. For this third round of adverts, we let the public decide which region would feature. In a two week competition, the North East fought off the North West, Midlands and Northern Ireland to secure £1m worth of free advertising at Heathrow. The North East will now see four advertisements showing its breadth and beauty presented across digital screens in all terminals at Heathrow from the end of August until the end of November. For my part I cannot wait to go to Heathrow and see the Wall on display!! 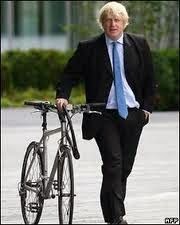 Boris is a low tax, centre right, one nation politician who really understands people and how to beat Labour. I am delighted he is going to be involved in the 2015 election and will be happy to welcome him back to the House of Commons, if successful, in 2015. To use the football analogy - "He is a top striker and you need your best players on the pitch." I have met Boris many times and he is a complex character - very bright, very experienced, a very successful two times Mayor with a proven track record. He also has a with a wicked sense of humour and a great speaking style. He is also a full time cyclist, a strong advocate of the living wage, and one of the best MPs I have ever seen at talking to anyone. He genuinely likes people, which is the most important asset inan MP. And he cares. He will be a big asset. Also he is very good at explaining why it would be lunacy to make Ed Miliband Prime Minister and Ed Balls Chancellor. And that is the prospect this country faces in 2015. I have long said that there is no doubt that when the cities of the North work together real change can happen. We have seen this with the LA7, the proposals of the Adonis Report, and now this report. It is genuinely great news that the five cities in the north of England have come together with one aim, to improve their economic prosperity by working together. Manchester, Liverpool, Newcastle, Sheffield and Leeds have responded to a challenge set them by the Chancellor, and Sir David Higgins, the head of HS2, to begin competing more effectively with London. There is no doubt that the Cities of northern England are powerful individually but better as one force. This report and the progress made will ensure we are competitive and prosper in the global economy, and this investment in infrastructure will improve the links between all the major northern cities. The government have listened and built on the success of City Deals and devolved funding. The Local Authorities are now working together ever more closely and this can only be a good thing. Among the many major successes proposed are a new rail line using faster trains between Newcastle and the Darlington area designed to save 10 minutes journey time, plus speeding up and making more reliable services to London from Newcastle on the East Coast mainline before HS2 is completed; this coupled to the measures to enhance and grow our regions roads and airport are good things. It is debate time tonight at 8pm live on STV. For the non Scots based you can still watch online. I shall be watching. No one underestimates Alex Salmond but I simply do not believe he has answer to the many arguments in favour of the union = the best of both worlds. On the economic, military, European, healthcare, banking and pensions issues I believe that the SNP are unable to prove to the Scottish people that they would be better off alone. More importantly I believe that the message is getting through to the Scots that we who are south of the border are genuine in our desire for them to stay. We are better together, and having beaten everyone from Napoleon to Hitler together, I want this wonderful United Kingdom to remain and thrive individually and collectively. Do debates matter? Ask Texas governor Rick Perry, who was a much-fancied contender in the 2011 race for the Republican nomination before he bombed spectacularly on air in a live pre White HouseTV debate. He withdrew from the race shortly afterwards. Similarly in the first US presidential TV debate in 1960, Republican nominee Richard Nixon famously lost out on the presidency after many thought he appeared sweaty and shifty next to a polished and confident John F Kennedy. At the last general election I remember very well the packed debates in Hexham abbey, which definitely made a difference to the many who were there. On any interpretation this is the biggest debate in Scottish history. I shall be going north in the morning from Newcastle and Hexham and have privately rented a bus to take everyone, but obviously need to know numbers if at all possible. We shall be going to Jedburgh, Galashiels and across the Borders area persuading Scots who have a postal vote (which land on their doorstep around that day) that we are better together. If you want to come in your own car, and can carry others, then also please let me know. This is a cross party trip, so all are welcome - I have already campaigned with many liberals and labour politicians in Scotland, and in Westminster, on this issue. The state of our country is at stake. Yesterday I spent the afternoon in a packed Hexham Abbey as Northumberland came together to pay their respects and commemorate the bravery of our troops who went to France so full of hope in 1914 and thereafter. As we know the war was not over by Christmas 1914, and the lives of those who survived was one long struggle of death, mud, and a changing perception of the conflict. I have never been to a more vivid or moving service. This was a seamless blend of theatre, church, military, interested parties, local community and supportive charities all coming together in a sacred place. Due praise must go to the organisers, particularly The Lord Lieutenants team, the many churchmen of differing faiths, and the rural Dean, Dagmar, who along with all the helpers at Hexham Abbey, made this event possible. Everyone I spoke to afterwards agreed that the use of the two outstanding actors to bring the tragic events to life was a resounding success. The lessons to be learnt were many, not least that peace is precious and often very hard won. Security and freedoms can never be taken for granted. But the service did much to covey the full horror of what those who served endured for all of us. I believe very strongly that it is important that the children of our generation need to have an understanding of what went on 100 years ago; I am delighted that so many of our local schools have plans to take their schoolchildren to the battlefields and monuments so that they have a better understanding. Roots to Prosperity is an action plan for change and growth in the forestry and timber sectors, here in the north of England. It is well supported by all the local county councils and lays out an action plan for how the sector can expand and hopefully create more jobs. I am speaking tomorrow at the event in Hexham and keen to listen and learn from the many experts there as to how we can harness the local areas desire to grow the sector. 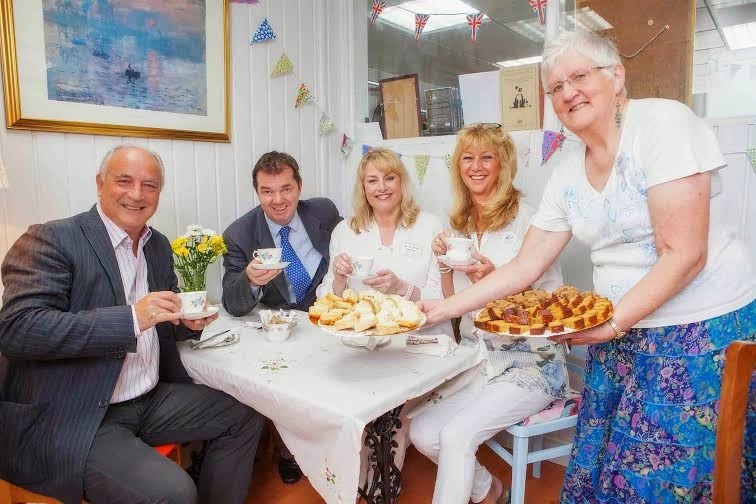 The BBC's Colin Briggs presided over the opening of the new store in Ponteland on Friday where a packed shop celebrated the expansion of Tynedale Hospice at Home to Ponteland. The store is so much more than a charity shop - as it has a delightful cafe in the back with delicious cakes, scones and the like to turn the shop into a destination in its own right. It was a good opportunity for me to spend time with the many volunteers and professional staff at Tynedale Hospice, and to raise a salute to Brian Massey MBE, who leads the organisation with unflagging enthusiasm and who was recently given his well deserved honour by the Queen. It was a great afternoon for all those who braved the thunderstorm. And the short speech by Colin put it very well - that Tynedale Hospice at Home are the ones who look after the ill and the elderly so well, and that they are the helpers there to cope with death and disaster. If you can support this wonderful charity please do so. Then on Tuesday October 14th Rob Caskie is returning to give his talk at the Queens Hall on Rorkes Drift. Anyone who heard him last year will know that he is the finest of all speakers and with a tale to tell that will stir the blood of any Briton. It is an event not to be missed. It opens with a very entertaining "Town Talk" that acts as an editorial / main article to the national coverage in a style that is part Victorian Quentin Letts (of the modern day Daily Mail) and part The Spectator. And Dr Alexander's Turkish, Galvavic and Medicated baths - all to be found at his premises in Orchard House, Corbridge. The back page features an old style version of the Village Notes we all like so much to this day, and a brilliant report of the unexpected acquittal and sudden marriage of Mr Bewicke of Threepwood. It also makes the point that the first editor, Mr J Catherall published his paper back then on a Tuesday not as we do today. The paper is full of news, reports from parliament, endless court cases described in gory and pretty salacious detail, and special sections on the arts, farming, gardening and the like. Well done to the courant for reprinting their first edition. It is a collectors item and well worth a read. I shall be there - and we are welcoming the band of the Royal Regiment of Fusiliers, members of the Northumberland Theatre Company, and various military charities. The Abbey Choir are singing. I am really pleased that so many key local community organsations are also involved. This event has been really well organised. It is very important that we remember those who gave their lives and the changes the war brought upon us as a country. It is sobering to think that so many of our local men from 16 upwards went away to the war never to return. We are indeed very fortunate not to face such a conflict today, nothwithstanding all the problems that we see around us.